Those familiar with this blog know that Sylvia Plath's first suicide attempt is a topic I have covered in years past. Not just in blog posts, but at length in my article "'They Had to Call and Call': The Search for Sylvia Plath", published in 2010. Since that time, many new articles have been located. In fact, the bibliography of articles that appeared in that paper had the number of found articles at 172. As of today, including recently found articles listed below, there are 196. 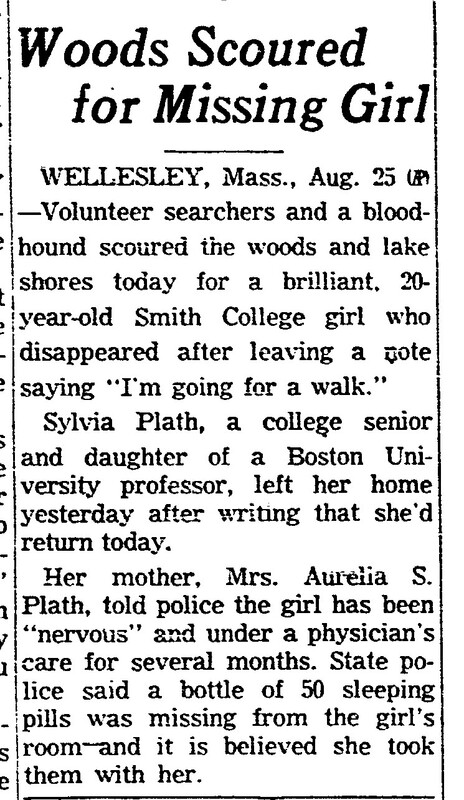 This increase of 24 articles shows that the search for Sylvia Plath continues. So far this year, I have found four new (to me) articles. Two articles each from the Detroit News and the New Orleans Times-Picayune. For those not up on the lingo of our suthun' Cajun-Creole-French brothers and sisters, a picayune is actually not a great thing at all. Of its uses, it can mean "petty; worthless" (as a adjective) and "a small coin of little value, especially a 5-cent piece" (as a noun). "Long Hike." Detroit News. August 26, 1953: 46. "Missing College Girl Found Under Porch." Detroit News. August 27, 1953: 11. "Woods Scoured for Missing Girl." The Times-Picayune. August 26, 1953: 5. "Missing College Girl is Located". The Times-Picayune. August 27, 1953: 10. One might spend time revisiting previous posts on this blog using the tag "First Suicide Attempt"; but that might be cumbersome. In order to present the current full list of articles I have compiled, I have therefore added a page to my website for Sylvia Plath, A celebration, this is. On the Bibliography page, click "Articles on First Suicide Attempt" to access the list (or click here directly). It is a work in progress, as any bibliography is, and will therefore updated whenever new articles are located or better information (if applicable) is made known to me. If you live in a town or city that has newspapers on microfilm, please consider going and looking at newspapers for articles from 24-28 August 1953. Maybe we can all grow this list to make it a little longer and more comprehensive. Whether or not you find anything, please email me (see contact page) and let me know what you have checked. And many thanks in advance if you do. All links accessed 7 February and 31 July 2015. The following is a guest post by writer Gail Crowther and artist Anthony Cockayne. 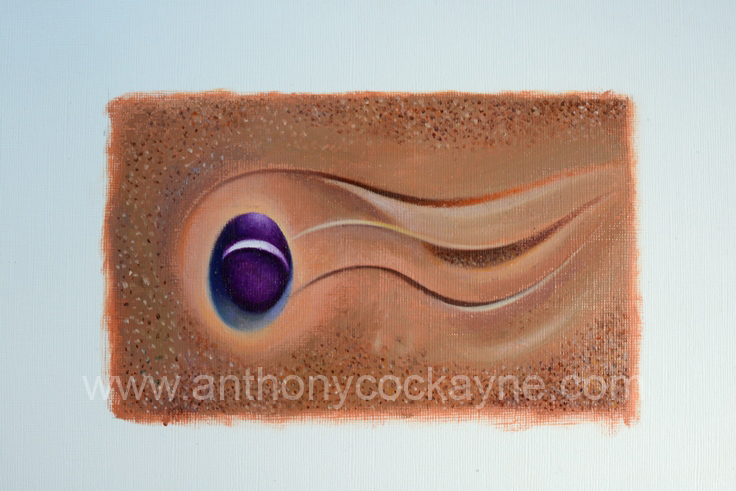 Please read more about Crowther and Cockayne's collaboration: The Collusion of Elements. On 28 October 1961 Sylvia Plath was published in a UK women's magazine called My Weekly. This, she hoped, would be the start of a career in which she would break into the 'slick' women's magazines and hone her skills writing playful short stories alongside her poetry and novels. As she stated in a letter to her mother on Christmas Eve 1960, 'The wonderful thing about these stories is that I can do them by perspiration, not inspiration, so I can work on them while Frieda is playing in the room . . .' (LH p. 403) The story published was called 'The Perfect Place' (working title 'The Lucky Stone') and the genesis of this piece can be found in an earlier blog post by Peter, and in his Plath Profiles essay, "I Should Be Loving This: Sylvia Plath's 'The Perfect Place' and The Bell Jar" comparing elements from this story to her first novel. Peter argues that since this was among one of the last stories that she wrote before launching into The Bell Jar, certain characters and aspects of the story were almost a trial run for what was to come. The story recounts the orphaned Joanna visiting Whitby with her boring and domineering fiancé, Kenneth, and while there, falling in love with an artist called Simon who owns the boarding house in which she is staying. Some of the scenes in the story are funny (Kenneth falling over on the beach rocks in his expensive London suit), some of them are predictable (it is obvious Joanna will end up with Simon from the first moment he appears in the story). However, there are flashes of classic Plath throughout this piece, the use of certain words and startling phrases that somehow lift the story just above the formulaic. In June I visited Whitby with the painter Anthony Cockayne to start work on a bigger project between writers and artists. 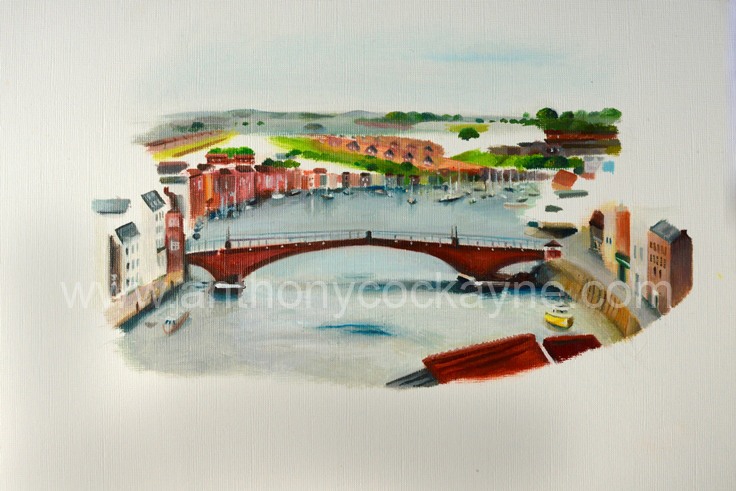 While there, we decided to trace Plath around Whitby and explore some creative responses – Tony painting scenes from the story, me taking photographs and writing notes. In many ways, seeing the places that Plath describes always brings them alive and illuminates the creative process that must have taken place between Plath's observations and her written page. Using extracts from the story, we hope to recreate Plath's Whitby for the reader in a sort of visual pilgrimage. While on the beach, Joanna meets Simon who is painting a seascape on an easel above the rockpools. He points out starfish and crabs in the pools and takes Joanna to look for lucky stones, finding one which is deeply purple and ringed with white. Later in his studio, he shows Joanna his paintings of the town and the sea and she finds herself 'lost in the dark vaults and moon-blued arches of the ruined abbey.' (p.6) The town, is full of stories and myths. ...she thrust her hands into her pockets. Her right hand encountered a round, hard object. 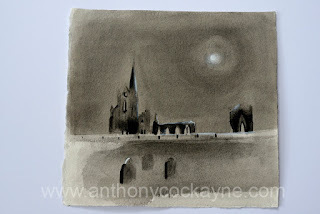 Curious, she drew it out and examined it in the glow of the abbey lights. All illustrations © Anthony Cockayne. Must not be reproduced without permission. All photographs © Gail Crowther. Must not be reproduced without permission. All links accessed 5 August 2015. Sylvia Plath's "Mules That Angels Ride"
Christopher Geissler, the Librarian for American and British Literary and Popular Culture Collections at Brown University, and Gerrianne Schaad, the college archivist at Southern Florida College, provided invaluable information on the Wallace Stevens Award. The "Wallace Stevens Contest" to which Plath submitted her poems was held by the Southern Florida College in Lakeland, Florida. Schaad found an article (pictured left) regarding the contest printed in the student newspaper The Southern on 14 March 1958. The contest requirements were as such: "The national poetry contest is open to authors who have either had a volume a verse published by a known publishing house, or at least three poems published in recognized magazines with a cash prize of $1,000 going to the winner … Poems submitted in the contest should not exceed 350 lines and must be unpublished" (2). The judges that year were Conrad Aiken, R. P. Blackmur, and Allen Tate. Geissler let me know that an advert for the contest appeared a 1958 issue of The Writer: "Florida Southern College announces the Wallace Stevens Award of $1,000, open to authors who have had a volume of verse published, or at least three poems published in recognized magazines" (Vol 71, p 28). This is a magazine Plath knew and read; in fact, Smith College holds several copies formerly belonging to Plath (though not the one in which appears the quote Geissler provided). During my four day trip to the Lilly Library at Indiana University, Bloomington earlier this year in March, I had occasion to look at just about every box and every folder in the Plath mss II collection. In Box 12, Folder 2 is a notebook Plath kept during the spring semester of 1958 whilst she was auditing Priscilla Paine Van der Poel's Modern Art course (Art 315). The course catalog for that year reads: "Contemporary art and its background from Jacques Louis David and the French Revolution to the present. Open to sophomores by permission of the instructor. Open also in the second semester to students who have had a course in nineteenth-century art abroad. Recommended background, 11. M T W 10. Mrs Van der Poel" (49). The notebook was spiral bound, 80 sheets, purchased from the Quill Bookshop, then located at 100 Green Street, Northampton (now Ford Hall, opened in 2010). The cover is brown with a dark green band towards the top with "SMITH COLLEGE" printed in goldish-brown color. At the bottom, Plath has written her name "Sylvia Hughes" along with "Library 59", which was where her office was during the year she taught at Smith. Aurelia Plath has added a sticker-label on it that reads "Modern Art Notes". Present are other annotations by Plath including text (a partial/incomplete line "the man in the west moon" from Dylan Thomas' "And Death Shall Have No Dominion"), scribbles/doodles, and division/computations. "The Disquieting Muses"; "The Lady and the Earthenware Head"; "Virgin in a Tree"; "Battle-Scene from the Comic Operatic Fantasy The Seafarer"; "Departure of the Ghost" ("The Ghost's Leavetaking"); "Perseus: The Triumph of Wit Over Suffering"; and "Snakecharmer". There are a few possibilities, though, for the eighth poem. The first I list here because it was included at one point with the above seven. Plath listed these poems in short title format, not including full titles. So the actual title of this poem is unknown but Plath's short title was "White Cow" and it consisted of 55 lines. The difficulty with this is that Plath wrapped the title in parenthesis and crossed out the line count. Parenthesis, in Plath's lists of poems, generally means exclusion or omission, a change in thought, or possibly indecision. Another possible poem, also presumably lost, is on the subject of a cat & bird (based on Paul Klee's 1928 painting Cat and Bird). Plath mentioned this in her 22 March 1958 letter to her mother saying: "a little lyric on a cat with a bird-stigma between its eyebrows, a really mammoth magic cat-head" (Letters Home 336). In this letter she enclosed two poems: "Battle-Scene from the Comic Operatic Fantasy The Seafarer" and "Departure of the Ghost" ("The Ghost's Leavetaking"). But, a poem on the subject of a cat and bird does not appear in these lists. The third possibility is another poem altogether, which feels to me in my analysis to be a complete cop out, but there we are. Readers should note that in "The Ghost's Leavetaking" printed in Letters Home includes an extra stanza that Plath later removed at the suggestion of her sister-in-law Olwyn Hughes. This stanza (originally the fifth) was also captured in recordings Plath made for Lee Anderson in Springfield, Massachusetts on 18 April 1958 and at for the Woodberry Poetry Room on 13 June 1958. Thanks must go out to Peter Fydler for asking about "Mules That Angels Ride" in an email, to Gail Crowther for reading and commenting on this post, to Christopher Geissler at Brown University and Gerrianne Schaad at Southern Florida College for their help, to Aurelia Plath for saving everything, and to the Plath archives at Smith College and Indiana University. All links accessed 9 April 2015.